Milgrain detailing on a wedding band embraces vintage-style elegance. Milgrain uses small metal beads to create texture and was first popular during the Edwardian Era, which lasted from 1901 until 1910. Milgrain can be used as a simple accent or as the main design. To modernize milgrain, use multiple bands of milgrain beading to create stacks of texture. This ring features rows of milgrain details within the core of the band. Go bolder and contemporary with a wider band. 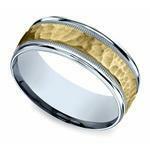 This 8 millimeter band of yellow gold stacks multiple rows of textured milgrain detailing and a sleek satin edge. 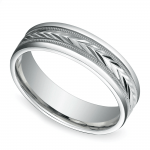 Beads or grains of milgrain patterns are often used to frame other designs at the center of the band. Use milgrain details to draw the eye to an inlay, a unique pattern or even gemstones. The outside edges of the band often look best with a satin finish to showcase the texture of the milgrain border. However, hammered or sand blasted edges can add a casual and more contemporary vibe to the band. One of the easiest ways to modernize milgrain is to use the elegant detail as a frame around contemporary patterns. In these two rings, a textured wheat-inspired central design is bordered by milgrain designs. The edges of the palladium ring are left smooth to showcase the detailing. Yellow gold warms up the same ring design. While the details are more modern, yellow gold also tones down the contemporary feel for those who still like touch of tradition. Borders are used to draw attention to patterns, but they can also be used to create more texture around a textured core. This design is incredibly masculine and gives antique milgrain an edgy style upgrade. This palladium wedding band features a swirled brushed center design bordered by bands of milgrain and edged with a satin finish. 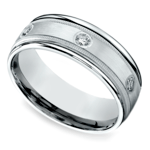 The swirled design blends with the milgrain, but the satin edges are used to add a softer contrast to the ring. This swirl design is the same as its palladium counterpart, but rose gold gives the ring a more modern twist. 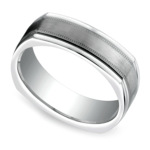 This platinum band is simple, yet masculine. A hammered center adds texture and the classic milgrain border and satin edging provide the finishing touches. Add contrast to the same hammered design by choosing yellow gold for the center. Mixing metal hues instantly elevates the look, making it more modern and trendy. Use segments of shapely details to add contrast within a ring. 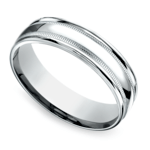 A beveled segmented center is outlined in understated milgrain and features satin edging. Subtle texture tones down the edginess of the ring, without losing modernity. 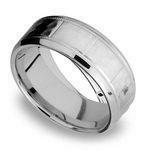 This titanium ring features a brushed and rough center design bordered by milgrain accents and set with a beveled edge. The center of the ring doesn’t have to feature any design to make it modern. A simple sleek, basic band bordered with milgrain edging creates a timeless but contemporary ring design…like this palladium men’s band. Wider bands offer a bolder contemporary styling. Choose a hefty six millimeter band in yellow gold that offers a sleek center bordered by textured milgrain. More modern designs can also be created by mixing metals to create contrast. 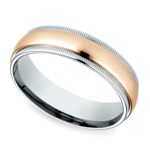 This men’s band marries a warm rose gold center with white gold milgrain detailing. The cool and warm mix allows both details to pop. Shape and sculptural details can define a ring. Use milgrain borders or edging to draw lines and interest around the corners of structured bands. 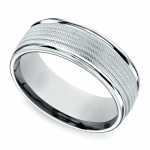 In this ring, architectural styling gives dimension to the white gold band. 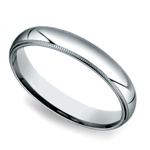 A brushed center is outlined with textured milgrain band details. Sculptural interest may also be etched or carved within the band, instead of relying on the shape of a band. 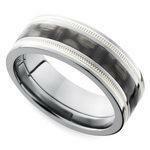 Black titanium is a dramatic and bold choice for a wedding band. 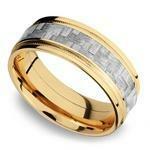 The center of the band is offset with diamond etched grooves bordered by gold bands of milgrain. Sculptural details and structure subtly define this ring, which uses flat edges to sculpt a modern design. The sleek center design is offset by bands of milgrain. Milgrain borders immediately draw the eye towards diamond details. 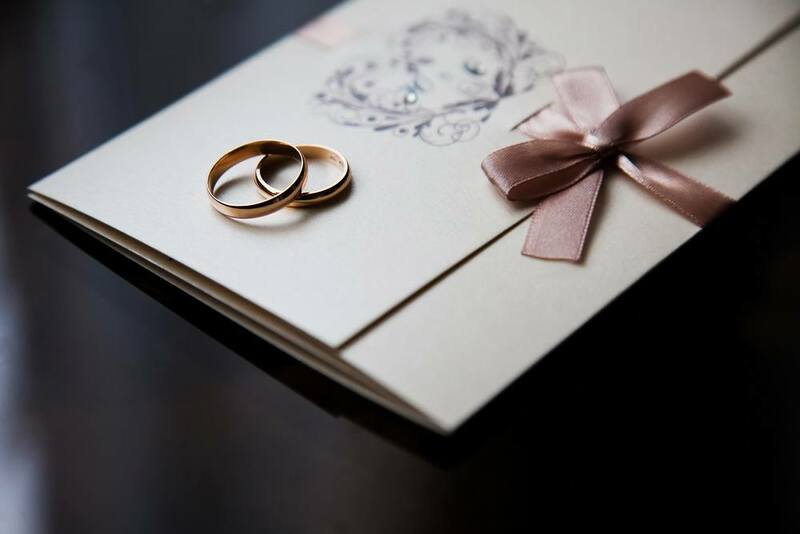 While pairing milgrain with diamonds might seem traditional, milgrain borders can be used in a more modern way and create contemporary styles. This yellow gold band mixes a brushed center with sleek edge work. The center is enhanced with drops of diamonds and a milgrain border. The metal hue can change any design and add to a more modern styling. Set in palladium, the same ring creates a more contemporary allure. Want to draw attention to an amazing or unique inlay? Use milgrain as a border to frame a unique material and make it pop within the ring’s center. These rings all include inlay materials and milgrain borders, but each offers a different play on a similar style. Carbon fiber is an engineering wonder, looks cool and is so on-trend. Set off the black eye-catching center with strips of milgrain and slick edging. 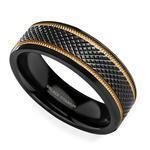 The same ring in yellow gold lets the silver hue of the carbon fiber pop within the band. Choose yellow gold for a bolder take on this style. 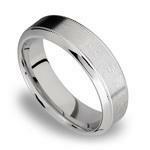 There are many different options for incorporating milgrain design work into a wedding band. 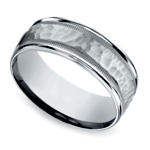 Use milgrain details to accent carbon fiber, diamonds, or even hammered centers. While milgrain is inspired by the Edwardian Era, this design detail can also create modern interpretations of this vintage trend for a contemporary take on an old tradition.